We are pleased to inform you that Prof. Rafał Pankowski, co-founder of NEVER AGAIN Association (pol. Stowarzyszenie NIGDY WIĘCEJ) and Sociology lecturer at Collegium Civitas, was honored with this year’s Paul Ehrlich-Gunther K. Schwerin Human Rights Award. Prof. Rafał Pankowski was appreciated for his consistent action against anti-semitism and racism. The award was established in 1998 by the American Anti-Defamation League to honor people fighting against anti-semitism in Europe. 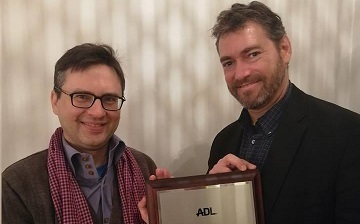 ADL Director for European Affairs Andrew Srulevitch presented the award during his visit to Poland on February 6, 2019. ‘NEVER AGAIN’ has campaigned against racism, antisemitism and xenophobia, for peace, intercultural dialogue and human rights both in Poland and internationally.